Release notes - Website of the open source Sokoban game JSoko. the "go through boxes" feature introduced in version 1.84 caused problems with the solver and the optimizer. This is corrected in this version. When the player or a box is clicked the reachable squares are now shown with a little circle graphic. 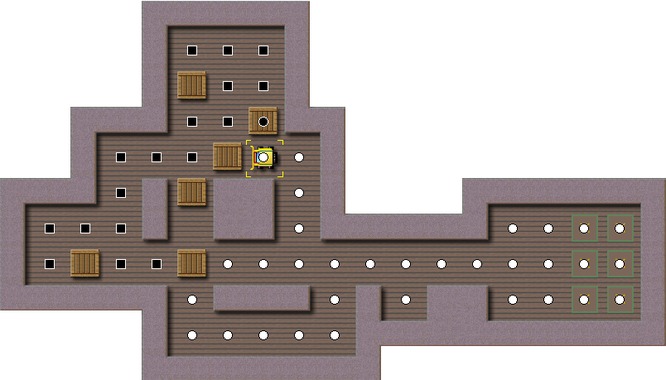 The player can now "go through" boxes that can be pushed away and then back to the original position for reaching the actual box to be pushed. A white circle indicates reachable positions that can be reached without the go through feature. A dark square indicates positions that are only reachable when pushing boxes due to the go through feature. The boxes that can be used to "go through" are marked with a black circle. Using this feature it's possible to select a box for pushing that can only be pushed when going through other boxes by pushing them first away and the back to the original position. Many thanks to 愉翁 who has implemented the "go through" feature in JSoko and provided the new translation. He is the author of the android app BoxMan. Optimizer: The optimizer methods moves/pushes and pushes/moves now also leverage all available RAM and all CPU cores. They are slightly faster than the methods that also optimize the secondary metrics. If you are only interested in solutions having the best moves and pushes than the moves/pushes and pushes/moves methods are therefore the primary choice for optimizing. then the depth starts with 100 until depth 300 is reached. This way it's easier to see in which pushes range the optimizer finds new improvements. The maximum board size is 100 rows/columns. Note that the default settings.ini is copied to the user folder at program start. In order to change the value the settings.ini file in the user folder has to be changed (For Windows this is: %appdata%\jsoko). Setting "Show minimum solution length": the calculated lowerbound for the solution length is now immediately shown after selecting a solution. JSoko now uses UTF-8 for writing files. The optimizer GUI has changed. The solutions list and optimizer log have switched their places. Suggested by users having low resolution screens. - Moves/most Pushes: this method can sometimes be better when a new best solution needs more pushes than the solution to be optimized. - Box lines/Moves: can be used to shuffle the solution a little bit before optimizing for moves again. - Box changes/Moves and Box changes/Pushes: can be used to shuffle the solution a little bit before optimizing for the primary metric (moves or pushes) again. Bugfix: the played moves are saved in the database when a level is left by the user so the user can continue where the level has been left when the level is reopened. However, yet, JSoko has stored too many snapshots which causes problems with the database. Thanks to Alice for reporting this bug. Bugfix: when a comment for a solution is saved, JSoko couldn't load the following levels in a level collection, anymore. Bugfix: Check for new version hasn't succeeded anymore, due to a new https issue. The "Info" menu has been integrated in the "Help" menu. This is a more common menu structure. Thanks to Brian Damgaard for suggesting this. Fix: Check for new version hasn't succeeded anymore since SourceForge switched to only allow https connections. New Feature: users having an account at letslogic.com can submit solutions using the new API Key provided by that website directly to letslogic. Note: JSoko must know the level ID from letslogic for submitting solutions. Hence, please download the levels from letslogic.com since those files do contain the letslogic IDs. bug fix: the optimizer has run in an endless loop in certain situations. Thanks to findus for reporting this bug. bug fix: the optimizer couldn't optimize levels that have all boxes on goals. Thanks to findus for reporting this bug. bugfix: some skn-skins couldn't be loaded anymore. Thanks for tripleb for reporting this bug. bug fix: the optimizer returned invalid solutions in certain situations. Thanks to Alice for reporting this bug. bug fix: JSoko sets back the saved moves history when a level is loaded. There was a bug setting the wrong player start position in the coding. Thanks to Alice for reporting this bug. A level title like "500+" has been interpreted as own level. This is fixed now. Thanks to P. Voyer for reporting this. bug fix: in levels containing a goal room the tunnel logic has been using the wrong box. This could result in unnecessary long solutions. bug fix: the last moves history hasn't been correctly set when a level has been loaded again in some cases. JSoko now uses UTF-8 as standard encoding for reading files. When the level editor is active, the "close window" action now closes the editor instead of the whole JSoko application. A new skin from Scott Lindhurst can be used. Thanks to Scott Lindhurst for this skin! bug fix: entering the editor and leaving the editor again without changing the level results in internal crashes of the program. In this case please switch the level up and down one time so the current level is loaded again. database: the collections of the database and the last 5 played collections are displayed in a list in the main GUI for quicker access. The key "c" opens the list of the collections, the key "l" the levels list. JSoko is published using install4j installer for Windows. Therefore all user data are saved in the default user directories ("user home"). Translator: the language texts can be exported to a file to share them. The size and position of the optimizer GUI is saved to the settings file and restored from there when the GUI is opened again. Levels that aren't loaded from the database (but from hard disk or clipboard) are automatically saved in a new collection "unregistered". Every time a level is loaded JSoko checks whether a similar level (comparing the level elements: walls, boxes, goals, ...) is already stored in the "unregistered" collection. If this is the case, the solutions of the stored level in the database are added to the loaded level and the level is connected with the one in the database. This means adding new solutions or deleting solutions from the loaded level also adds the solutions to / removes the solutions from the level in the database. Nevertheless, it's recommended to import all levels to the database manually (menu: Database->Import collection to database). This way the levels are stored for a collection having a specific name. bug fix: in some cases the pushes/moves and the moves/pushes solver couldn't find the optimal solution. Thanks to Alexey for reporting this bug. bug fix database: the selection for levels without a collection assignment wasn't correct. This is fixed now. Thanks to F. Minklei for reporting this bug. Support of "interior empty rows": a level now can contain empty lines. These "empty lines" must only contain spaces except the first character which must be a "-". Improved Chinese translation. Thanks to Anian Wu for this update. bug fix: Clicking at "Info -> about JSoko" caused an "out of memory" error. Thanks to garbelinchen for reporting this. Optimizing for 5 metrics takes a lot more time than just optimizing moves and pushes. However, this new method can leverage all cores of a system and use more RAM as the other methods. Hence, on multi cores systems this method can be as fast as the old moves/pushes optimizing method. The results of this methods are the same as of the normal moves/pushes method except that the found solutions are also optimized for box lines, box changes and pushing sessions. For instance the "512m" in java -Xmx512m -jar JSoko.jar can be replaced by a higher number like 5000m to allow JSoko to use 5000MB (= 5GB) RAM. For more information have a look at the JSoko help pages. bug fix: Chinese translation caused an exception in the program. Thanks to anian for reporting this. optimizer: it's possible to manually mark the area to be optimized. The area not marked is now displayed darker to indicate it's not optimized. Optimizing for 5 metrics takes a lot more time than just optimizing pushes and moves. However, this new method can leverage all cores of a system and use more RAM as the other methods. Hence, on multi cores systems this method can be as fast as the pushes/moves optimizing method. The results of this methods are the same as of the normal pushes/moves method except that the found solutions are also optimized for box lines, box changes and pushing sessions. replay can be started using key "R"
quicker box configuration phase in optimizer when using more than one box for optimizing. Thanks to Brian Damgaard for his help. Optimizer: iteration mode and selected active area now stays as it is, even when optimizer is optimizing only a pushes range. Optimizer: the deadlock detection now runs at most 3 second to ensure the resources of this computer aren't used too much. bugfix: In the optimizer a solution stayed colored even after the optimizer has finished. Double-clicking a "short cut" in the file chooser dialog now immediately loads the file. Improved Dutch translation. Thanks to Joris Wit for this update. bugfix: the closed diagonal deadlock detection crashed JSoko in some levels due to squares "outside" the board (example level: "Bruno Druille 80"). Thanks to Heiner for reporting this bug. bugfix: some of the settings weren't saved anymore. Improved Dutch translation. Thanks to J. Wit for this update. JSoko includes two new languages: Chinese and Dutch. Many thanks to Lei Zheng and Joris Wit! New Translator tool to change the language texts. Thanks to Pawel Kleczek! bug fix: clicking at a level in the graphical level browser now loads the selected level. This doesn't work in version 1.59. The rotation and/or flipping of the board is now represented by a new tool bar icon. In the graphical level browser levels having at least one solution are displayed with a check mark. Thanks to Minh Hoang for implementing that! If the solver is opened and then closed the main window lost the focus so it has to be clicked again to play with key board. This is fixed now. new feature: a new tool bar button allows to view multiple levels at once to select one for playing. Thanks to Minh Hoang for implementing that! When the optimizer is opened the board is set back to the initial board position in the game view. Now the board stays as it is when the optimizer is opened. Thanks to Brian Damgaard for this suggestion. If only a part of a solution is optimized (pushes range optimization) the displayed values during the optimization reflected the fake level created from the selected pushes range. Now the displayed values reflect the values with regard to the original level/solution. Thanks for Jean-Pierre Martel for this suggestion. bug fix: when the optimizer has been started for optimizing a range of the solution and a new solution has been selected during the optimizer runs the optimizer couldn't be stopped anymore by the user (however, the optimizer normally stopped after having finished the optimizing). bug fix: if the level is rotated or flipped while an animation due to a selected box is displayed the animation stayed at the previous box position. game play: the player can be moved by click&drag. Boxes can be pushed by click&drag. game play: when the mouse enters the slider for browsing through the moves history the cursor turns to a hand symbol. Thanks for this suggestion to Brian Damgaard. bug fix: if the optimizer is used for optimizing a pushes range and iterating is enabled the optimizer can't be stopped up to the second iteration. In this version the iteration is automatically deselected when optimizing a pushes range is selected. bug fix: if the optimizer is used for optimizing multiple solutions at once the solutions are colored to indicate that these solutions are being optimized. In some cicumstances the last found solution stays colored after the optimizer has ended. This is fixed now. history slider: the history slider is now integrated in the moves/pushes display area. pathfinding: the menu item for switching between moves optimized pathfinding vs. pushes optimized pathfinding has been removed. There now is a button in the toolbar for switching instead. new feature: there is a new toolbar button for replaying a solution automatically. bug fix: levels that contain boxes outside the player reachable area (usually boxes and goals set there for beauty reasons) have caused a crash when the level contains a savegame/snapshot. bug fix: in huge free levels the path finding has crashed. This is fixed now. bug fix: if the optimizer is opened and then the another level is loaded in the game solutions couldn't be imported in the optimizer anymore. * the pushes range optimization has been changed. Example:<br>If a range from 10 to 50 is selected the solution is analyzed. All boxes that aren't pushed in this pushes range of the solution are changed to walls. Furthermore the level is changed so that the board after push 10 is taken as new start position and the board after push 50 is taken as end position. This way higher vicinity values can be used for optimizing. * Yet, the optimizer has always tried to find improvements in all parts of a level. In order to be able of using higher optimizer settings it's now possible to mark the area that should be optimized. This is simply done by clicking or dragging in the board displayed in the optimizer (holding down the cntrl key or using the right mouse button when selecting the area will delete the marking of the selected area).<br>The optimizer then will only search for improvements in the selected area. This way it's possible to mark a really small area and then even use 3 boxes for optimizing (for instance: three boxes with a small number of vicinity squares like 6). bugfix: if the level is switched while the optimizer is running the optimizer has added the solution to the currently loaded level. This is fixed now. bugfix: if a solution is taken as new history while the solver is running the solver sometimes crashes. Now it's not possible anymore to do this. new feature: JSoko now supports run length format for copying a level or solution to the clipboard and loading a level / solution. Many thanks to Minh Hoang for the coding for this. The history slider is smaller now. Therefore showing it doesn't move the rest of the GUI too much too the left. bugfix: The solutions have not been ordered correctly by secondary metrics in every case. This has been fixed in this version. new help: JSoko now shows a help at the start of the program. Currently this help is only available in English. It's possible to open this help from the program by pressing the F1 key. optimizer: The optimizer offers a new check box for fixing the player end position. This is useful for players who split levels into several sub levels for better optimizing results. Thanks to Ming for suggesting this feature. Fixed a display problem: levels which aren't assigned to any collection have been displayed multiple times in the levels view instead of just one time. Furthermore some internal debug information have been printed to the console. These prints have been removed from the coding. JSoko now supports exporting a solution to the clipboard in run length format. Thanks to M. Hoang and M. Gobelli for contributing coding for this! New feature: in the database menu of JSoko there is a new menu item " " for importing more than one collection from the hard disk to the database of JSoko. If you have some collections you play very often you can import them to JSoko. If they are then loaded from the database JSoko will automatically save your solutions in the database, too. In the database enter the text to search for (for instance in the author text field "a*") and press enter. The GUI will then show all data that matches your input (for instance all authors whose names start with a "a"). Since version 1.49 the search is case insensitive. bug fix for simple deadlock detection: JSoko in rare cases falsely declared squares as deadlock squares. This resulted in false deadlock messages, false shown dead squares and let the optimizer run in an endless loop. Thanks to Sokobano for reporting this bug. optimizer: bug fix for deadlock identification code: the optimizer now can find all deadlocks again. Due to a bug yet JSoko has missed some. bugfix: fixed missing text for "save file"
GUI: removed label texts, because the Nimbus L&f shows them in the optimizer. optimizer: new text "Optimization method courtesy of Sébastien Gouëzel"
general: the program starts with a resolution of 1024 * 800. If this is too large for the screen its size is reduced to the screen size. However, some OS like "MS Windows" reserve some space for a toolbar. The program now takes this into account. bugfix: switching the skin while the editor is activated set the level status to "level unchanged"
general: Replaced the sea background by the graphic "drops"
caution: reverse mode gamelines may start with ">", hence, gamelines need special action (YASC 1.302 includes a correct implementation).